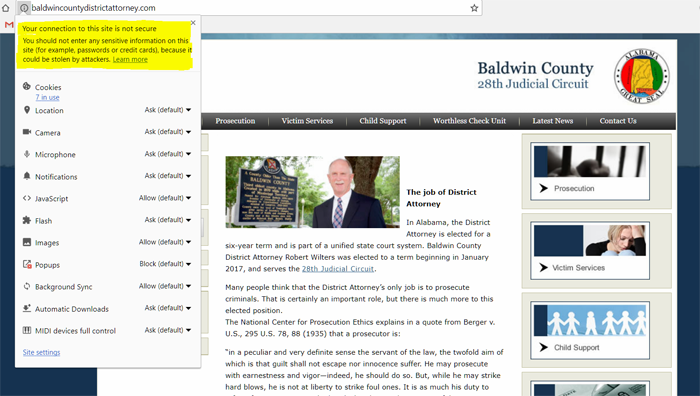 Look at the Image Above Baldwin County District Attorney does not have a secure site. Have you ever questioned what's taking place behind the scenes of your very own company's website? Online presence is a must when you run a business. If your small company doesn't have a website, there's no way you can outshine your competition. Installing an SSL certificate though, can guarantee your website is safe. You can safely showcase your services and products, without worrying your sensitive data is being accessed by someone you didn't authorize! Today, a beautiful graphic design and a well optimized website aren't enough to guarantee your clients will trust your brand. You should do whatever you can to ensure your customers both like and trust you as a business. If you were wondering why SSL certificates are highly recommended, check out at the following 7 important facts every local business owner needs to know. 1. SSL certificates offer a higher level of security. An SSL certificate serves as a shield. In fancy terms, a Secure Sockets Layer certificate allows the transfer protocol to create a security layer to add end-to-end encryption. In other, and much simple words, SSL certificates simply ensure the data you share between your visitor's browser and your own server stays secure. With the online becoming more dangerous with every passing day, reassuring your visitors they're browsing your actual, real website is vital. 2. When your website is SSL protected, your clients will trust you more. Once your visitors feel safe to use your website to their advantage, they will immediately feel more secure and comfortable to share their personal information with you. 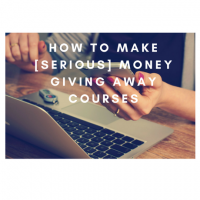 This is vital for you, as a business. Whether your users feel safe to buy your products or simply consent to leave you their email, you've managed to create a bond between them and your company. When growing your business is a priority, gaining the trust of your visitors is the n. 1 step towards business success! 3. Your SSL certificate is instantly recognizable. Speaking of behind the scenes, you should know your extra security layer is instantly recognizable! If it's safe or not to buy from your website, your clients will immediately know. They'll also know immediately whether their email or telephone number will be secure within your database. Installing an SSL certificate on your website implies redirecting HTTP connections to HTTPS. Since visitors will recognize your website as a trusted, reputable source online. 4. An SSL certificate is mandatory if you sell your products online. Among one of one of the most important facts you really need to know, is an SSL certificate is mandatory if you store sensitive information, for example, your clients' charge card data! Buying online has become a common habit lately. If you're offering your clients the possibility to purchase a product directly from the website, you need to install an SSL certificate right away. 5. No website is too small to be hacked. Often times, small website owners skip installing that extra layer of security. As a business just starting out, you shouldn't risk the safety of your client's data, even your website is new! Malware and web crawlers aren't curious about the age or size of your website. It's always your customer's personal data they're after. Whether you have 10 or 10,000 clients, their sensitive information is equally important. 6. An SSL certificate could boost your website's rankings. One great, and quite a useful advantage, is the possible boost in your online search engine rankings! Websites with installed SSL certificates tend to be seen by Google as a trusted source. Therefore, the online search engine's algorithm could favor your website and push you closer to the top. Give SSL certificates a serious thought if you were looking for ways to get ahead of your competition. Google prefers to be on the safe side and it rewards its users who help the web be more secure. 7. The cost of an SSL certificate is worth the investment. SSL certificates don't come free of charge. Then again, they're really worth the investment! Every single client counts when you run a small business. And for all the reasons explained above, installing a Secure Sockets Layer certificate will ensure your customers know you respect their safety. The cost of an SSL certificate could be significantly less than the business you might lose. Because of lack of security might cost you a lot more in the long run, turning clients away! Installing an SSL certificate on your website implies redirecting HTTP connections to HTTPS. And it's good news for your business! Since visitors will recognize your website as a trusted, reputable source online. Malware and web crawlers aren't interested in the age or size of your website. Whether you have 10 or 10,000 clients, their sensitive information is equally important.